Nowadays , unfortunately, it is not rare for a remote system to reject emails from you. If you check the SMTP logs, you will note that right after you connect to a remote system to send an e-mail, you are disconnected, which usually indicates the remote system is blocking your IP. Other times, your server's IP might be listed on some DNSBL. There are even systems that block emails from an entire country, based on their IP. 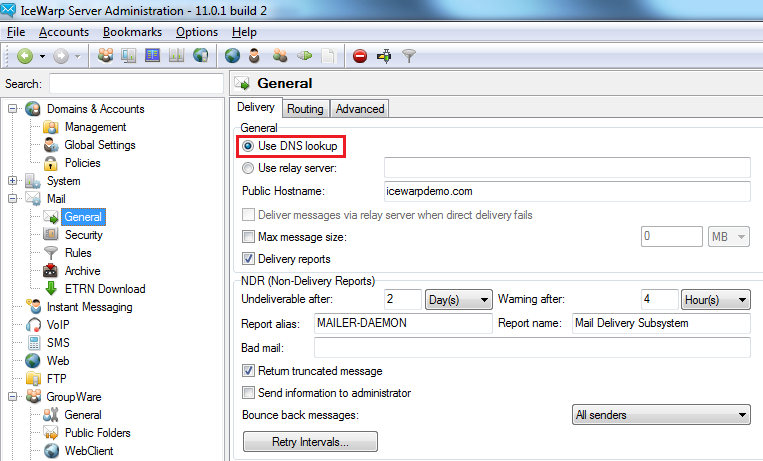 This means that Icewarp will query the DNS servers specific in System/Internet connection to find out remote system's MX and connect to it directly, to send outbound mail. 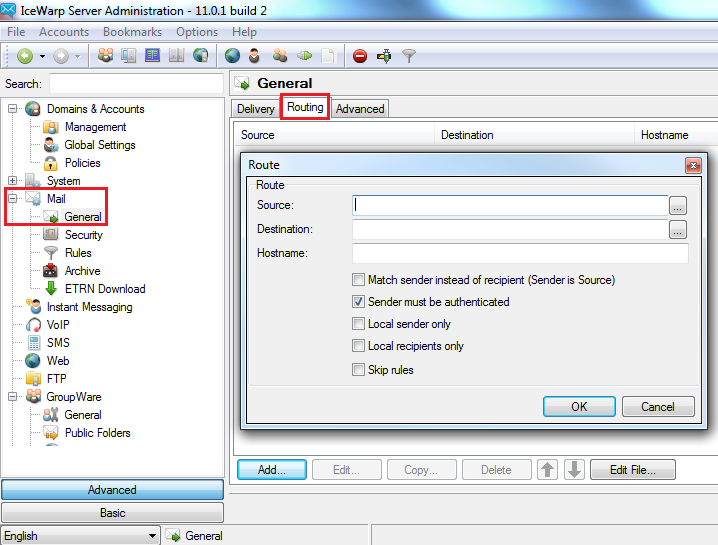 The best way to set up SMTP routing is by clicking on the Edit file button, so you are editing the configuration file directly with notepad. On the top part of the Window, you should see comments and a comment button, so you can show/hide comments. Note the included examples. If you want to redirect all emails to yahoo.com via SMTP server relay.isp.com, just change the line shown above, replacing the 2 places where aol.com appears with yahoo.com. After you do the changes described above, be sure to restart the SMTP service (System > Service) and check your SMTP logs to be sure emails to these destinations are being relayed correctly. Another nice option in Icewarp is the possibility to try to send all messages that were not successfully sent by your main mail server, through another SMTP server. This means that all messages which couldn't be sent by your main server, such as mailbox full at destination, account doesn't exist or blocked on a DNSBL, are sent to the relay server, so it can try. If the syntax above does not work, replace the % after word username with a @. Check your SMTP logs to understand how SMTP authentication works and how to decode it. After doing these changes, restart your SMTP service and be sure to check your logs and your relay server's logs, to be sure messages are being sent our correctly.